It’s Kelly here and I’m sharing a very simple watercolor card with you guys today. I started by adding walnut stain distress ink to only the right and bottom edge of the pot stamp. I didn’t ink the top because I knew I wanted the flowers to over hang the front of the pot. I added in my flowers only inking the areas I wanted to add. 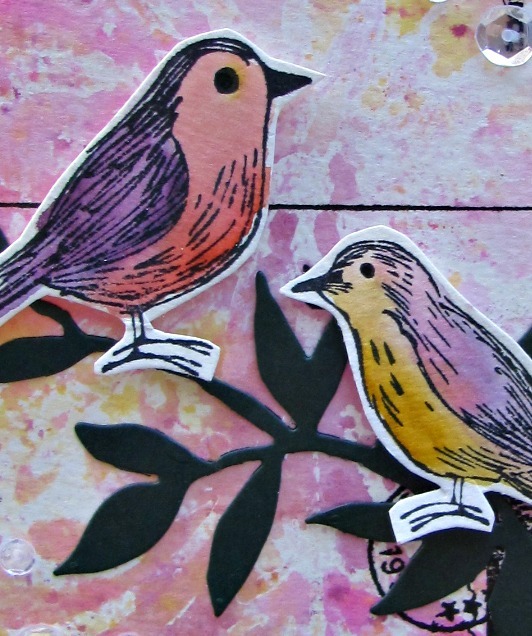 One of the many wonderful things about stamping with distress markers. For the flowers I used spun sugar because it’s dark enough to give you a guide but light enough that it won’t show after the watercoloring. I scribbled some distress ink onto an acrylic block to use for painting. For the flowers I used worn lipstick, seedless preserves, broken china, and chipped sapphire. I added more water to some petals or laves than others. This is what gives the beautiful variation that watercolor has. I added a bit of ground under the pot and stamped a simple sentiment to finish it off. Here’s the same card but with a butterfly added in. I didn’t really “Love” the way the butterfly turned out but that’s okay. You can’t be head over heels for all of them!! Have you played along in our current challenge yet, it’s New Beginnings. Births, birthdays, weddings, there’s all kinds of options 🙂 If you haven’t joined in don’t worry you have all month long! 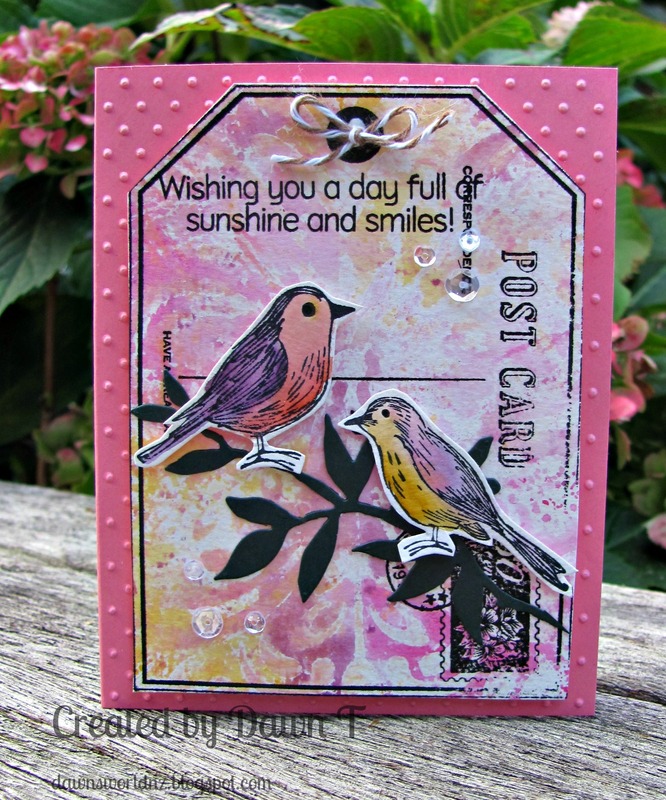 Categories: Handmade Cards | Tags: distress markers, Kelly Latevola, One Layer Cards, watercoloring | Permalink. Hi all. Dawn here with my first post as a designer for A2Z Scrapbooking. I am super excited to be here and hope over the course of my time here, I inspire you. Hero Arts products were amongst the first I used when I started stamping years ago. This month our challenge is nice and easy.. “Anything Goes” I am still waiting for my new Hero Arts goodies to arrive so I’m inspiring you with some older Hero Arts stamps mixed with some newer items too. Added a few sequins and popped it up onto the pink card base that was embossed with Swiss Dot folder. I encourage you to pull out your old Hero Arts stamps and give them some love, while you are waiting for your new goodies to arrive! Categories: Handmade Cards | Tags: a2z Scrapbooking Store, distress inks, distress markers, Hero Arts, stencils | Permalink. Hello everyone!! It’s Kymona from Kreative Kymona and I’m here with my last post of the year and I’m doing that with a POP of Color for you!!! You have a couple of days to enter our Watercolor Challenge for a chance to win a $25 gift certificate to the a2z Scrapbooking Store. I love watercoloring and I recently learn how to use distress markers to create a watercolor effect. What do you think? I love how the one flower has color so it’s the center of attention. I decided to cut two of the petals to add the sentiment behind the flower as to not cover up the flower. I added some Wink of Stella to the flower to really make that rich purple pop. Isn’t that amazing!!! You want to know how I created this card? Its quite simple! 1. I cut my watercolor paper to 5 x 3.75. 2. I randomly stamped my flower image using Memento Black Ink. 3. I used two distress markers to add color to the tips of my flower and the base of the flower. 4. I used my 4″round watercolor brush and water to pull the color down the petals and up from the base. I heat set it and repeated that two more times. 5. I stamped my sentiment using Versamark Ink and Hero Arts White Embossing Powder. I heat set that. 6. I cut two of the petals so that the sentiment panel could sit behind the flower. 7. I added one Hero Arts Gem to the center of my flower. 8. I adhered the panel to my card base. Very easy and sophisticated to create. Well, now its your turn!! All of the supplies I used can be found at the a2z Scrapbooking Store. If you would like to purchase any of the supplies I used please head on over to the store and use the coupon code KYMONA15 to get 15% off your purchase. I hope my card gives you some inspiration to participate in our Watercolor Challenge. It runs to the end of the month, you only have 4 days left to play along. Categories: Challenges, Watercolor | Tags: distress markers, embossing, flower, gem, glitter, pop of color | Permalink.